My photo shows these socks in plain brown ragg- you will have to imagine the red stripes and heels. Small amount of bright red sock weight yarn (maybe 2-3 yards) for top stripe. If you want red heels, more red yarn will be needed. Size 1 short double-pointed sock needles- set of 5 (I used 5″ Brittany Birch needles), or whatever size needle you can get gauge on. 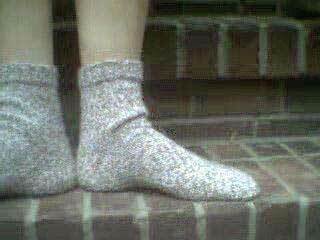 This pattern makes an average woman’s size sock. A Dutch heel is used, just because it’s my favorite-fitting heel. If you want to add red heels to your socks, I suggest you do a short-row type heel, instead, using red yarn in place of the brown ragg for all heel sts. Using red yarn, CO 60 sts. 12 sts on ndl 1, 16 sts on ndl 2, 16 sts on ndl 3, 16 sts on ndl 4. Join to knit circularly, and rib in K2, P2 for 1 rnd. Change to brown ragg yarn, and continue K2, P2 rib for 1″. Re-distribute sts so there are 15 sts on each needle. Work in St st (knit every round) until the total length measures 5″. *K1, Slip 1* to last 2 sts, K2, turn. Repeat these 2 rows until heel flap measures 2 1/4″, ending with a knit row, turn. Still working on 30 heel sts, P17, P2tog, P1, turn (leaving remaining sts unworked on the needle). Sl 1, K5, K2tog, K1, turn. Purl to one st before the gap left on the last row (where you slipped a st), P2tog- (closing that gap), P1, turn. K to one st before the gap, K2tog, K1, turn. Continue in this manner until all stitches have been worked in the row, ending with a knit row. Pick up 18 sts along left edge of heel flap, using the same needle heel sts are on. Using a second needle, knit the first 15 sts of the sock front. Using a third needle, knit the remaining 15 sts of the sock front. With a fourth needle, pick up 18 sts along right edge of heel flap. Knit the next 4 sts onto needle 4, with the 18 sts just picked up. Now your sts are divided properly onto 4 needles for decreasing of the insteps. K to last 3 sts on needle 1, K2tog, K1. K across needles 2 and 3. On needle 4, K1, SSK, K to end. Continue alternating these 2 rounds – decreasing instep every other round – until you have decreased back down to 60 sts: 15 sts on each needle. K even on 60 sts, until length from back of heel measures 7 1/2″, (or the length of your foot, minus 2″). Needles 4 and 1 now hold the bottom of the sock, and needles 2 and 3 hold the top of the sock. Beginning with needle 4, K1, SSK, K to end of needle. Next needle, (#1)- K to the last 3 sts, K2tog, K1. Next needle, (#2)- K1, SSK, K to end. Next needle, (#3)- K to last 3 sts, K2tog, K1. K around- all 4 needles. Repeat these two rounds until 24 sts are left (12 on sock top, 12 on sock bottom). Weave the 12 front sts to the 12 back sts, using Kitchener St.
Repeat pattern for second sock.